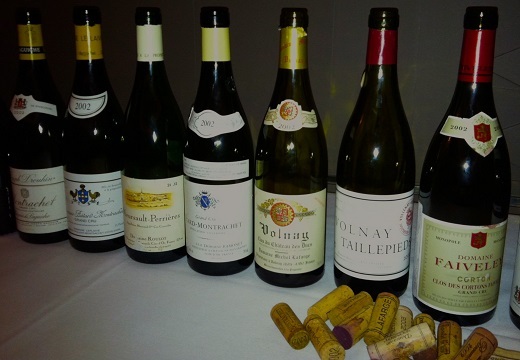 This past spring I enjoyed a number of fabulous dinners at Eleven Madison Park, including this 2002 Burgundy retrospective, which I hosted for the Wine Workshop. On this night Chef Daniel Humm and his team prepared a fabulous menu, culminating with the lavender honey-roasted duck, one of Humm’s signatures as well as one of the very best dishes in New York City today. As I have noted in previous articles, since this dinner Eleven Madison Park has moved exclusively to an elaborate tasting menu concept, although I am told the offerings in the private dining rooms remain unchanged. Although the food was stellar, on this night our focus tilted more towards the wines. Still, the level of execution from the kitchen and the wine service, headed by Wine Director Dustin Wilson, was unparalleled. Very few restaurants get all the details right, but here, at Eleven Madison Park, such excellence is simply the point of departure. It is pretty courageous to serve ten year-old white Burgundies, especially at a high-profile event like this one, but the wines came through in spades. The most interesting of the wines in our first flight was the 2002 Domaine Leflaive Bienvenue-Bâtard-Montrachet, which remained bright, layered and beautifully focused throughout the course of the evening. The Leflaive was even better when I came back to it at the end of the evening. Although still young, it embodied all of the qualities Burgundy lovers seek in age worthy whites. I loved it. The 2002 Drouhin Montrachet Marquis de Laguiche was almost as impressive, although stylistically it was quite a bit more honeyed, voluptuous and creamy. Roulot’s 2002 Meursault Perrières was good, but slightly forward, not unusual for this particular wine and vintage. The Ramonet Bâtard-Montrachet was also tasty, if not quite up to the level of this storied domaine’s finest bottles. Our second flight was utterly brilliant. All three wines were dazzling. It was tough to pick a favorite, but if forced, I tended to favor the Faiveley because it seemed to have so much remaining upside. The 2002 Marquis d’Angerville Volnay Taillepieds was deep, rich, resonant and beautifully balanced. Exotic notes dominated the 2002 Lafarge Volnay Clos des Ducs, especially in the bouquet. Both Volnays were open for business and drinking beautifully. The same can’t be said about the Faiveley’s 2002 Corton Clos des Cortons, which was tight and imposing from the very first taste. Still, it was impossible to miss the wine’s huge center of fruit, phenomenal balance and massive potential for the future. What a gorgeous wine! The third flight was very interesting, as it generated quite a bit of discussion. People either loved or hated the 2002 Roty Charmes-Chambertin Très Vieilles Vignes. A gamey, animalistic note gave the Roty considerable wildness, a quality that some tasters appreciated more than others. I very much liked the wine’s decisive personality. Drouhin’s 2002 Griotte-Chambertin was quite pretty, subtle and understated. Unfortunately we had a very good – but not great – bottle of Rousseau’s 2002 Chambertin. If any doubts persisted about the level of this particular bottle, they were erased when we tasted the Clos St. Jacques later in the evening. The 2002 Clos St. Denis from Dujac was in great shape. It was also one of the best and most distinctive wines of the night. Layers of sublime, finely knit fruit flowed from this understated, classy beauty. Ponsot’s 2002 Clos de la Roche was exotic and intriguing, but also rough around the edges. Another highlight, Mugnier’s 2002 Musigny soared from the glass with gorgeous aromatics, beautifully delineated fruit and striking overall balance. It was a beautiful and highly representative bottle of this great icon Burgundy. Our last four wines paired beautifully with Daniel Humm’s lavender honey-roasted duck. Domaine de la Romanée-Conti’s 2002 Echézeaux came across as quite powerful, rich and deep, with sweet tannins and layers of round, generous fruit. The 2002 Grands-Echézeaux was more aromatic, higher-toned and feminine in its personality. It, too, was quite pretty. Sadly, the 2002 Romanée St.Vivant from Domaine Leroy was corked, but a bottle of the Vosne-Romanée Beaux-Monts quickly appeared in its place. The dark, voluptuous and powerful side of Vosne came through in this deeply spiced, expressive Burgundy. A last minute addition, Rousseau’s 2002 Clos St. Jacques nearly stole the show (actually it did! ), proving why it is revered among Burgundy lovers. Arguably one of the youngest and most vibrant wines of the evening, the Clos St. Jacques impressed for its intense fruit and phenomenal balance. It was the perfect ending to a fabulous night of food, wine and conversation.